New York Times bestselling author of Outlander Diana Gabaldon mesmerized readers with her award-winning Outlander novels, four dazzling New York Times bestsellers featuring 18th-century Scotsman James Fraser and his 20th-century time-traveling wife, Claire Randall. Grand, sweeping, utterly unforgettable, Diana Gabaldon’s new novel is riveting entertainment, a vibrant tapestry of history and human drama. 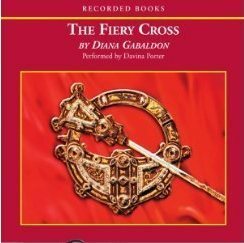 Crossing the boundaries of genre with its unrivaled storytelling, The Fiery Cross is a gift both to her millions of loyal fans and to the lucky readers who have yet to discover her. This is book 5 in the Outlander series and I opted for the audio version. It didn't start out that way, one of my little reading quirks is protecting my books by not breaking the spine, which would have been next to impossible with a 1400+ mass paperback. But I did try, I began reading and reading and reading some more waiting for something exciting to happen and finally I switched over to the audio book. Like I said it's a big book with the audio coming in over 55 hours in length. 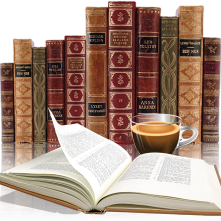 Davina Porter is the reader and she is phenomenal, I enjoy every book that I have ever listen to that she has done. I will admit with this one I put the speed up to 1.25 and towards the end for the last 10 hours I ramped it up to 1.5 just because I wanted to finish this thing. Was the book that bad? No, it wasn't but it is not one of my favorites. The first book and Voyager (book 3) hold that title. With The Fiery Cross I just found the book rather flat. It chronicles life for the Fraser family as they prepare for weddings and life on the ridge. There were peaks in the storyline where I was thankful for the action and intrigue but they were short lived. Did I hate the book? No I didn't, Diana Gabaldon has a wonderful way with words, she knows how to describe, embellish and immerse the reader into the time period. But there were times where some words were not necessary and didn't really add anything to the story. I also think this book was setting the groundwork for the Revolution and what will happen when the date of their deaths comes around. I'm not going to jump into the next book just yet, A Breath of Snow and Ashes, it's another biggie coming in over 57 hours for the audio version. Maybe over the long cold winter months I will tackle it. I agree that this was a hard one to get through and keep interested in. So wordy that it really influences the flow of her plot. Definitely one of my least favourite books in the series. Glad you made it through! !